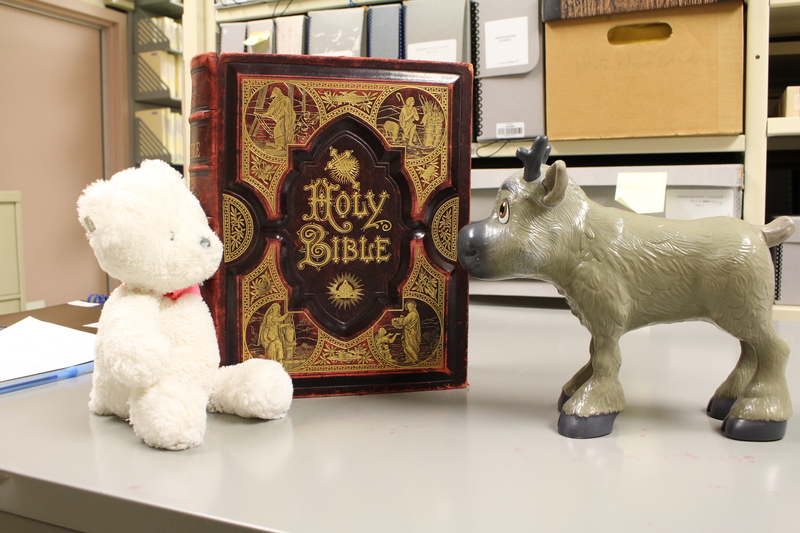 This Bible may be part of the Museum’s rare book collection, but oddly enough Sven also has the same one at home. These past few weeks have been very busy for Snowflake and Sven, with the First Fridays Ugly Christmas Sweater Party and the Museum’s ongoing Mitten Tree campaign. Today, they got to take a break from the holiday frenzy to spend another day in Collections. This time, they visited Alicia, Collections Technician- Archival at the St. Catharines Museum and had the chance to explore the museum’s incredible archival and rare book collection. The image of dust often comes to mind when thinking about archives. Sven admitted it. Yet, when the two toy friends entered our archival storage room with Alicia, they were amazed to instead find extremely organized shelves filled with books carefully covered and protected with special, acid-free paper. Not a speck of dust in sight. Snowflake loved looking at the old city maps! 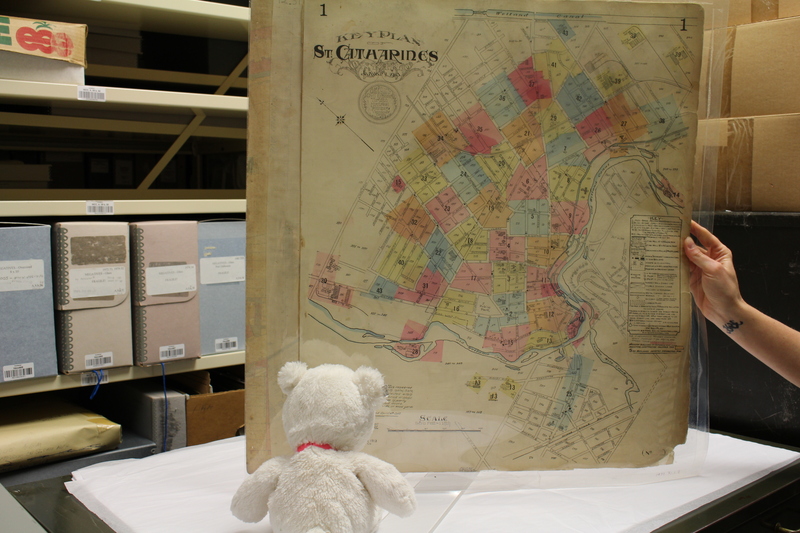 Snowflake couldn’t find the St. Catharines Museum on this 1910 Fire Insurance Map though. Alicia cares for the Museum’s entire archival collection. This includes the collection of over 10,000 maps and blueprints, school yearbooks, letters, diaries, official records and documents, rare books as well as the Museum’s reference library. Alicia takes pride in just how organized she and her team of volunteers keep our archival collection. Part of her job is to create finding aids for fonds so that researchers have an easier time looking for information on the subject matter that they are interested in. 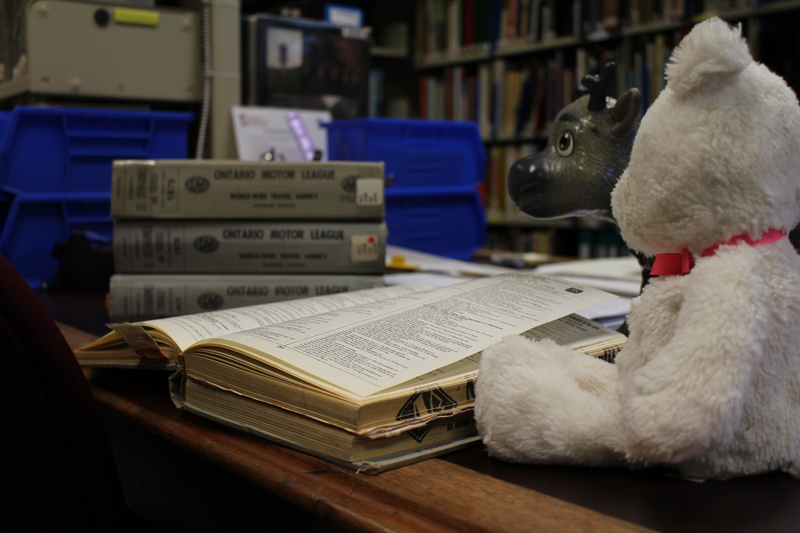 (Snowflake says that a fonds is group of archival documents originating from the same source, usually a donor). Researchers and genealogists may be excited to hear that Alicia and her volunteers also regularly update and maintain reference files of family names, businesses, churches, schools, ships, and anything else related to St. Catharines history. This makes doing research at the St. Catharines Museum a whole lot more enjoyable! Research is also a major part of Alicia’s job. All research requests, both from museum staff and the public, go to her. Luckily, this is her favourite part her job! Alicia loves that she gets to spend her career continually learning new things about the city she grew up in. She’s always looking for fun subjects to write about on her Ask Alicia blog series! There’s something meaningful about working with archives. Whether it’s reading a book once owned by William Hamilton Merritt, going through family letters or immersing yourself in an ordinary diary, the archive provides an intimate look at what everyday life was like in the past. Reading their words, getting a glimpse into what was going on in their world – archives help us connect to history in a more personal way. Doing a bit of research on their break from Mitten Tree supervising. If you’re ever interested in digging into the St. Catharines Museum’s archival collection, our reference library is open Monday, Wednesday, and Fridays 12:30-4:30pm. Snowflake and Sven will probably be there too, they’re currently trying to find their humans’ whereabouts in the old City directories. Sara Nixon is a Public Programmer at the St. Catharines Museum & Welland Canals Centre. 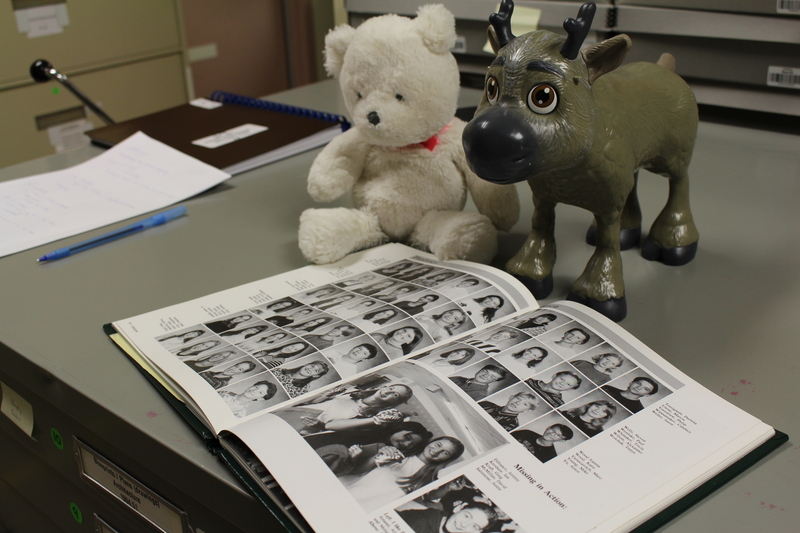 Sara thanks Alicia for her help in writing this piece and for trusting Snowflake and Sven with the Museum’s archival collection (and especially her yearbook!). Very interesting a good read . The bible looks exceptional.